Down in the Dinghy | From the Seasonally Occupied Territories . . .
I’ve said it before, but I’ll say it again: I’m not a gardener. My paternal grandmother was a gardener. Not me. I also hate fresh fruits and vegetables. I’ve said that before too. But I like getting dirty. So I have a little garden. It’s in a beached dinghy out back; I lean out over my deck railing and there it is. My neighbor-landlady’s garden graduated to a bigger plot maybe 30 feet away. She asked if I wanted to use the dinghy. Why not? thought I. This is my third year. Still, I’m not a gardener. I’ve got an ulterior motive: pesto. The pesto I froze at the end of last summer lasted me till the end of June. This in my book is success. I also grow tomatoes, mainly because who doesn’t? Unlike most people I know, I can take or leave tomatoes, but I do like the little cherries. In 2010, desperate to deal with a cherry tomato glut, I discovered the wonder of halved cherry tomatoes sprinkled with diced onions, drizzled with a little olive oil, and slow-baked for about two and a half hours. If you’d told me before then that I was capable of eating a dozen cherry tomatoes in 10 minutes, I would have said you lied. In my studio apartment there’s no room to start anything from seed, so if I want to put seedlings in the ground before Memorial Day they have to come from somewhere else. This spring was so warm that the seedlings I bought in late May looked like gangly adolescents already. Now those four tomato plants look like the hedge round Sleeping Beauty’s castle. The basil plants were leggy and looked ready to flower already, so I only bought one. It didn’t thrive — I think I didn’t water it enough — and has since passed on. The basil I started from seed, however, is doing fine. My pesto hopes are high. 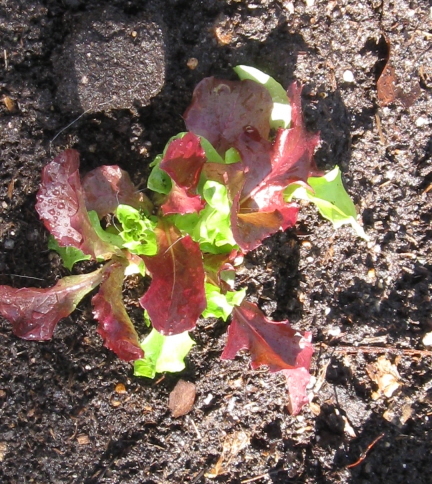 In late April someone gave me four little lettuces and assured me that it wasn’t too early to put them in the ground. I don’t buy lettuce because it goes gelatinous before I can use it up, but this spring I discovered the appeal of picking a few leaves whenever I needed them. By early July the lettuce had bolted, but I might try it again next year. I’ve even heard tell of a variety that likes hot weather and doesn’t bolt. Someone else gave me parsley, which has done fine for me in the past. Not this year. It started off OK then got reedy and broke off at the stem. Maybe not enough water, maybe something else. I use parsley in my pesto, but luckily it’s cheap to buy at the grocery store. Some of last year’s chives wintered over. When I transplanted out the chives that passed the winter in a plastic pot next to my sink, they looked spindly next to the hardy outdoor guys. Amazing what root room and fresh air will do: now you can’t tell the two clumps apart. 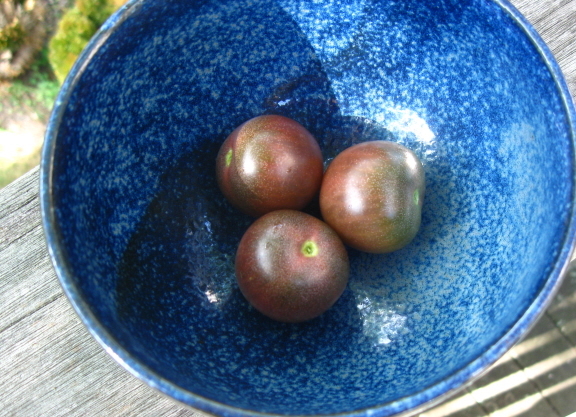 I’ve already harvested a few Black Cherry tomatoes, and there are lots more to come: more Black Cherries and a slightly larger red variety whose name I’ve forgotten. With growing season already in full swing, I started more tomato seeds up on the deck. 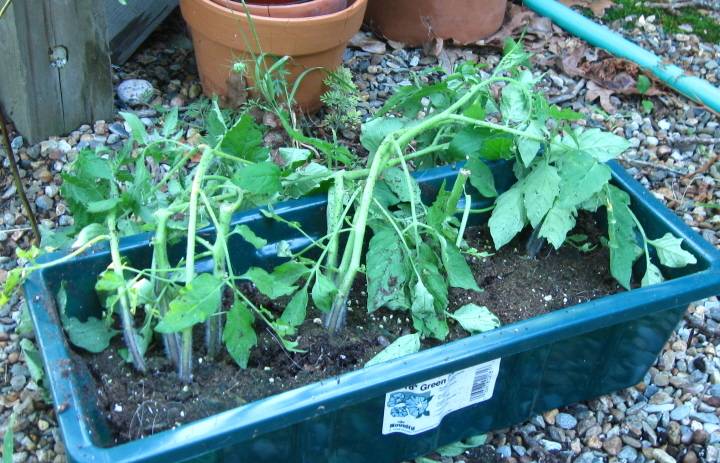 They had grown into tall seedings when a high wind in mid-July blew their planter off the railing. Of course the planter landed upside down. Two were pretty well broken, but the other two, though somewhat the worse for wear, seemed worth saving. I planted them where once the bolted lettuce grew. 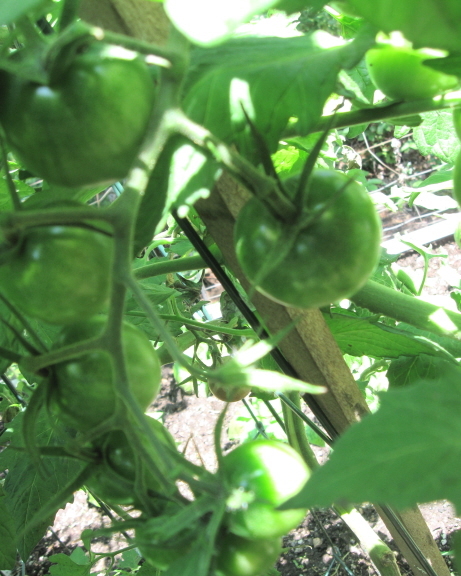 They’re doing fine, but even if they flower and fruit the tomatoes probably won’t have time to ripen before shorter, cooler days slow things down. The basil I started from seed is doing nicely. In another week or so there should be leaves enough for a batch of pesto. I’ve got more seedlings going up on the deck, in the planter that survived the unfortunate plunge. At present they’re barely peering over the planter’s lip, so they could probably survive falling 15 feet and landing upside down. To be on the safe side, however, if high winds are forecast, I’ll take them off the railing. There’s no such thing as too much basil. Note thriving chives and, behind them, the tomatoes that fell 15 feet and lived. 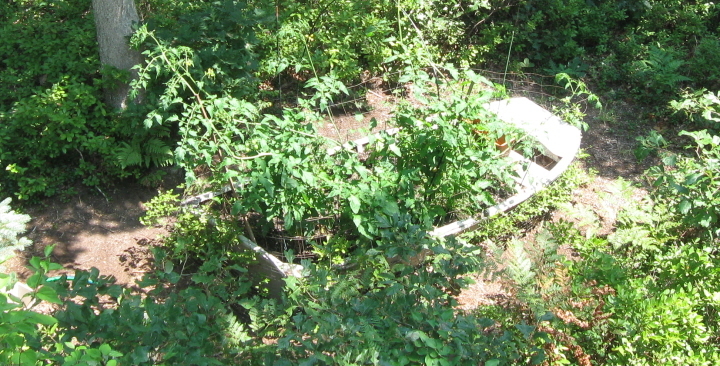 The tomato tangle as seen from my deck. The plants are all taller than any of my stakes. There are lots of green tomatoes in the thicket; you just can’t see them from here. 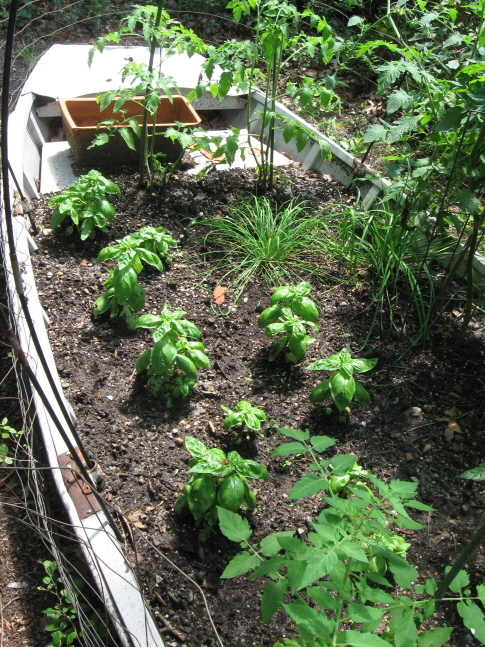 This entry was posted in home, Martha's Vineyard, outdoors and tagged basil, fresh vegetables, garden, pesto, tomatoes. Bookmark the permalink. I’m not gonna lie…I’m lovin’ the boat you used to plant them in. Great article! What a useful neighbor then! The backyard photoblog sounds like it would definitely be interesting! Hope to see it soon.